It’s not a real crisis or anything terribly important, but it’s something I’m wrestling with in my head and can’t get a grip on. My college degree is in Sport Management with a minor in coaching. I’ve worked for a Division I football team and athletic department for four years. I was lucky enough to get two championship rings while in college and led a student fan group that is still talked about six years after we left school. Sports are a large part of what I care about. Liberty (where I went to college) is especially important to me. The crisis comes in that I don’t think our football coach is that great. For most people, that wouldn’t be a crisis. That’d just be a typical Friday in November as their season is coming to a close. But I wrote earlier this week how the Gospel is making me rethink everything I thought I knew. I was talking about politics in that post, but it’s also impacting my fandom. This season, as Liberty has lost game after game to teams they shouldn’t, I’d go on the internet to tell people how I don’t think our coach is the guy to move us forward. I’d give stats to prove my point at times and I’d be super snarky at others. I’d go on vengeful benders to let the whole world know that we used to be better than we are now and we needed a new coach to make us good again. I’d get this feeling inside me that didn’t feel right. The best I can describe it is the feeling you get after fooling around with a girlfriend/boyfriend when you know you shouldn’t be doing what you just did. When I began processing through the feelings, I started to realize where it was coming from. As a Christian, I’m called to be different. I’m called to say nothing out of selfish desire and to only speak words that will build people up. I wasn’t doing that at all. So here I am, on the Friday after the most disappointing football season since I started school, wondering how I can voice my displeasure while still filtering that through the lens of the Gospel. How do we, as Christians, criticize or critique the world around us while still holding on to what we’ve been called to? This doesn’t just apply to sports. It applies to politics, the Church, our culture, and pretty much everything we encounter. 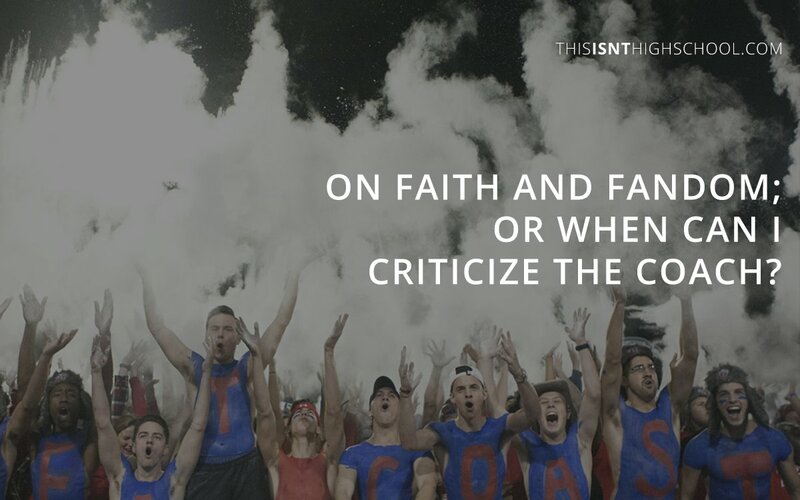 For us to stand out in a cynical world that’s always screaming about how much they hate everything, we have to figure out how to voice our opinions in ways that would make Jesus proud of us. I’ll be honest: I haven’t figured out how to do that yet. And that’s where the crisis begins. I certainly don’t have the answer, but maybe by sharing thoughts, you may find food for thought. First off, I believe there is a time and a place for divine or Godly anger. God flooded the world because of anger and shame. Jesus flipped over tables and wrecked the temple in anger. Having anger I do not believe is inherently wrong. I have more to say, but I can’t verbalize it well. I agree there’s a time and place for it. What I’m wrestling with is how to go about getting those feelings out in a respectful way.